We’re happy to announce that OrbitMoving.com is now live! The web site is built on WordPress, providing full CMS capabilities and in house management for their team. What sets us apart is the level of service we offer our customers. We provide free, no-obligation estimates, listen to your concerns, and find the solutions best suited to meeting your relocation needs – whether you’re moving your family, your business or just your products. As one of North America’s top international moving companies, we have established an extensive worldwide network of agents who share our passion for customer satisfaction. It is through this network of exceptional partners that we provide our customers with the highest level of service from departure to arrival. Orbit is a proud member of the International Association of Movers (IAM) and the International Movers Network (TIMN). Thanks to our solid reputation for providing outstanding service to our customers, we’ve built our business on steady referrals and repeat customers. Try Orbit once and we’re confident that you’ll use us or refer us again! 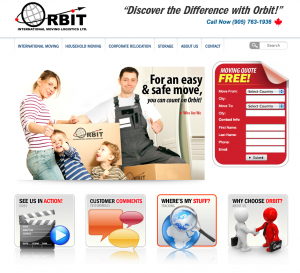 Visit www.orbitmoving.com to check out their web site.